Lunissanti begins with a procession held on Holy Monday (“Lunedì Santo”, hence the name), the day after Palm Sunday, bearing the Mysteries, the instruments of the Passion of Christ. At Castelsardo and Tergu, Lunissanti represents a synthesis of local sentiment, where the sacred and solemn moment of the evocation of the Passion blends with the secular feast celebrating the return of Spring. The ceremony begins very early in the morning, with a mass celebrated at sunrise in the Church of Santa Maria. 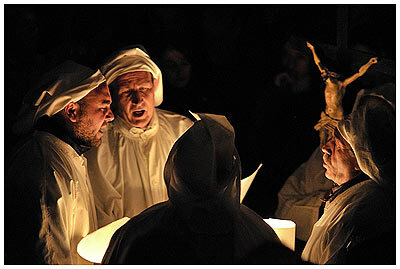 The mass is attended by the apostuli (confraternity members chosen to bear the Mysteries) and the cantori (members of the three choirs that participate in the rites), wearing the costume of the confraternity, a white hooded cowl. As soon as the mass is over, the procession starts off, bearing the Mysteries and alternating the groups of singers. The two mains parts – cantori and apostuli – are in turn divided into other parts. The cantori comprise three choirs, each of which takes the name of the piece they chant. The choirs are lu Miserere, lu Stabat and lu Jesu. Within each choir there are further subdivisions based on the tonality of the cantori. For the apostuli, the parts are established according to the Mystery that each one represents and bears. The procession, in which the clergy does not participate, moves towards the abbey of Nostra Signora di Tergu, advancing at the rhythm of the chants with a stop for each change of choir. After several hours, reaching the Monastery of Tergu, the Mysteries are displayed in front of the altar in the order of their arrival, while the chanting continues and the sacraments are celebrated. At the end of the mass, the participants meet in groups to have lunch in the fields in front of the abbey. It is here that one can see the feast for the arrival of spring, with eating and celebrating that, in other situations, would not reconcile with the solemn and tragic aspect of the representation of the Passion. In the evening, the participants return to town over the same route as in the morning, and the procession concludes upon entering the Church of Santa Maria from which it began in the morning. In Castelsardo, the route winds through the crowd-lined streets, the streetlights are off and the candles brought by the Confraternity brothers and sisters are lit, so walking through the characteristic medieval streets of the town centre becomes a very evocative experience. When the procession has returned, a large crowd of the local populace celebrates a solemn rite of thanksgiving for having once again had had the opportunity to participate in Lunissanti. For Castelsardo and its inhabitants, this feast represents their true cultural identity and is the symbol of their love of their homeland.